CM9 S2 CM9 S2 delivers a supremely well-integrated sound, and is capable of filling the largest of listening rooms with a coherent, insightful performance. It is a speaker with wonderful power, presence and naturalness, thanks to its two large bass units, FST midrange and Decoupled Double Dome tweeter. It is also just as much at home as the front speakers in a breathtaking home theatre system. CM8 S2 CM8 S2 is the most room-friendly floorstander in the range: a speaker with a slimmed-down profile designed to fit comfortably into most living rooms. Despite its leaner proportions, the CM8 S2 delivers amazing clarity, detail and realism due to technologies it shares with its larger siblings, such as an FST midrange and Decoupled Double Dome tweeter. 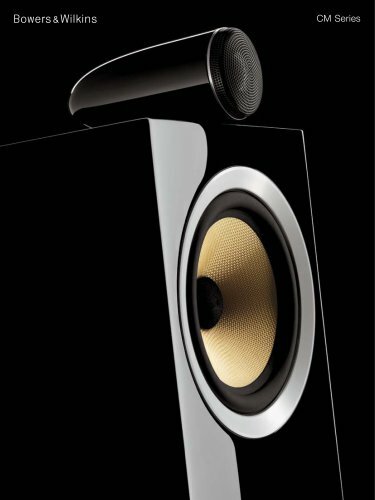 CM6 S2 The top-performing standmounted speaker in the range has a distinctive audiophile feature in common with CM10 S2: the tweeter-on-top design. Combined with a 165mm midrange/bass driver, the result is amazingly lifelike imaging and spaciousness from a speaker of its class. The new CM Series will transform your enjoyment of music, revealing all the depth and detail that ordinary speakers miss. That’s thanks to audiophile design innovations originally pioneered for our flagship 800 Series Diamond reference speakers, combined with new technologies developed especially for the range.